Each end of an EL wire connects to one or the other side of the glasses. 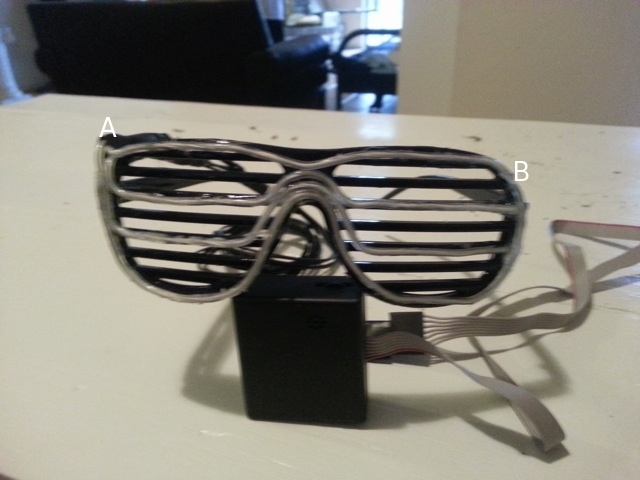 The sides of the glasses are labeled A and B in the image below. The ends of the EL wire attached to side A, of the glasses, are connected to the VU meter EL visualizer. The other EL wire ends (on side B) are just attached to the glasses. El wire is easily shaped using just your hands. Fold the EL wire to the shape of the glasses' frame. When you are happy with the layout of the four EL wires, glue them in place with E6000 adhesive. Let the adhesive completely dry before continuing. The 4 EL wires are connected to the VU meter EL visualizer by 5 wires total. Each EL wire has two connection wires on one end. All 4 EL wires have the connection end attached to side A of the glasses. One of EL wire's connection wires goes to a signal pin on the VU meter EL visualizer. The EL wire's other connection wire goes to a common pin on the VU meter EL visualizer. So, the common pin on the VU meter EL visualizer is connected to all 4 EL wires. The VU meter EL visualizer came with a red stripe on one side of its connection ribbon. The red stripe indicates which wire is connected to the common pin. The diagram below is of the VU meter EL visualizer's connector. The first light to turn on is connected to the signal wire labeled '1'. The last light to turn on is connected to the signal wire labeled '4'. The top two wires on the VU meter EL visualizer's connector are not used in this project. To connect the 4 EL wires to the VU meter EL visualizer's connector, a header was made by inserting the tips of 5 male jumper wires into corrugated cardboard. The header end goes to the VU meter EL visualizer and the other end goes to the glasses. 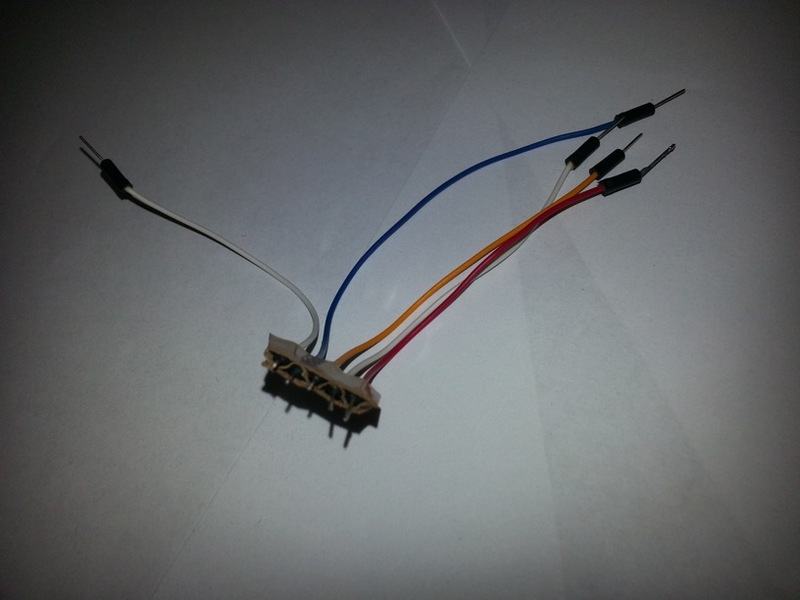 Below is an image of what the cardboard header can look like, before connecting it to the 4 signal wires and common wire coming from the EL wire on the glasses.